DEMBA Ba has thanked Newcastle United’s fans for their support in an “amazing” season. But in an interview posted on Youtube on Friday evening he failed to address the questions swirling around his future. 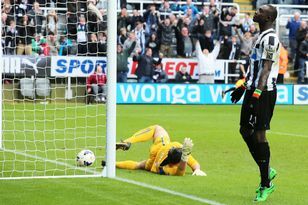 The Senegal striker was upbeat and positive about the club, his team-mates and the supporters who took him to their hearts during a terrific debut season on Tyneside. Anyone looking for clues on where his future lies would have been disappointed, however, as the forward preferred to concentrate on more prosaic matters. “The season has been very good for the whole club, the whole city and for me personally I had a very good season,” he said. “I scored 16 goals in half a season – plus we play in the Europa League next season so we’re very happy. The video was flagged up by Ba’s brother Hamady on Twitter, and the striker made sure that he took time to praise supporters. Ba admitted his goalscoring form suffered after being moved to the left of a three-man strike-force but tempered that by saying he enjoyed being part of the Newcastle squad. “The second half of the season was less prolific for me because I was put on the left wing. We won a lot of games like this and everybody was very happy,” he said. “I am very happy with the people I am playing with, with the national team and Newcastle. NEWCASTLE United are set to clinch the signing of promising Coventry City youngster Gael Bigirimana in the next few days – and set him the challenge of breaking into the first team next season.